There’s a new filament brand in town: Refil. Their filaments are made from recycled plastics. At the moment they offer black ABS (from recycled car dashboards) and PET (from recycled drinks bottles), with more colors and materials to follow soon. When we attended a presentation by one of the founders, he gave us samples of both filament types and we were eager to see if this stuff was any good. One of the main problems in any recycling project is that the source material is usually full of contaminants, additives and impurities. Refil appears to have solved this problem, using a combination of pickiness (only using RoHS/REACH-compliant source materials) and technology (working with industry partners from the recycling and processing areas). 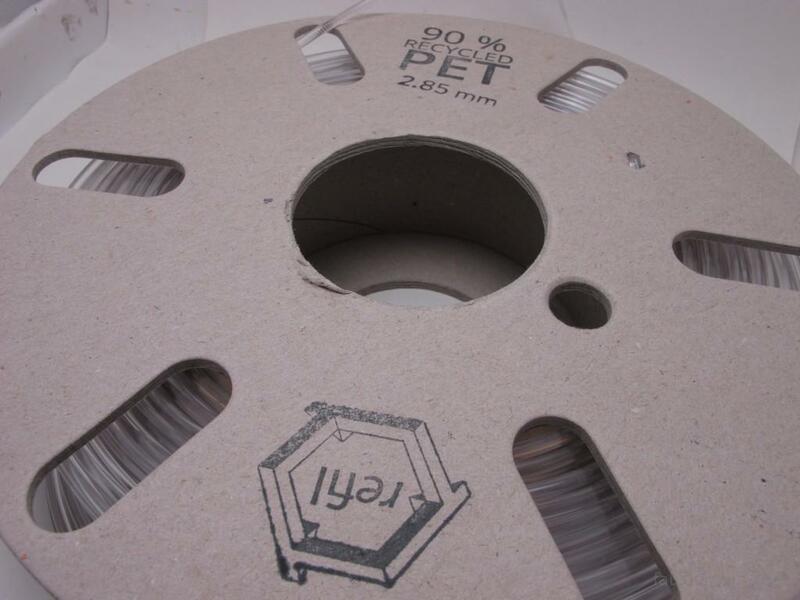 The result are filaments that look very good “on the roll”, indistinguishable from virgin material. Because the filament is made on very high-quality, industrial extruders, filament roundness and diameter is as constant as that of any other commercially produced filament. In keeping with the recycling philosophy, the spools are made of recycled cardboard, which is a nice touch. High-Impact PolyStyrene (HIPS) is one of the less known 3d-printing materials. Most people that have heard of it know it as a dissolvable support material used in combination with ABS, because it dissolves in d-limonene (and ABS does not). It is not frequently used as a printing material in itself. The guys from Form Futura want to change that because they believe that HIPS could be a very nice primary printing material. They are bringing out a line of HIPS filaments in 1.75mm and 2.85 mm diameters, at the moment only in white but black, red and gray are planned. They asked us to test a spool of their 2.85mm white HIPS and see how it compares to ABS and PLA. We wanted to look at a number of characteristics: extruder temperature, print bed, warping, quality and ‘smoothability’ (i.e., can HIPS be vapor-smoothed like ABS with Acetone). 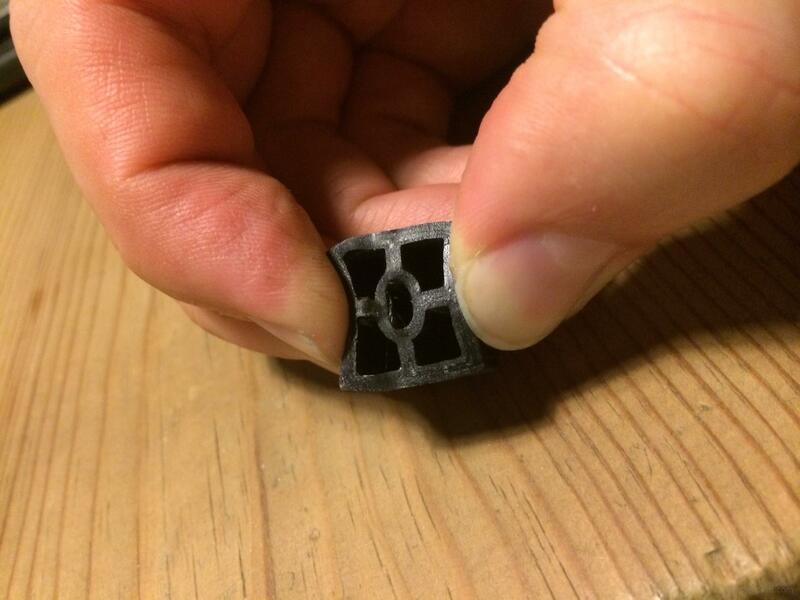 We’ve written before about smoothing ABS prints using acetone vapor. This works very well, blending the printing layers together for a smoother finish and increased strength. Acetone is not particularly toxic and easy to obtain (in the Netherlands, any chemist stocks it). For PLA, however, acetone smoothing does not work. This is a pity, since PLA is much easier to work with than ABS. We found some solutions for smoothing PLA, but most involve rather dangerous-sounding chemicals such as Tetrahydrofuran and Dichloromethane. The one exception we found is Ethyl Acetate which seems to give good results and is (relatively) safe. This was something we wanted to try for ourselves. 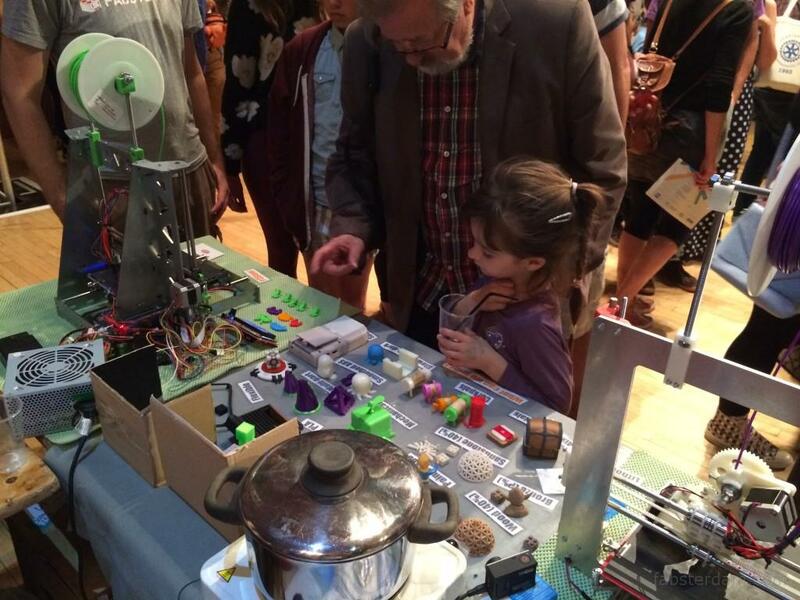 Last Saturday we had a stall at the Brighton Mini Maker Faire. We brought our two 3D printers and some sample ‘printies’ to show the possibilities of 3D printing, and the different filaments that are avaliable right now. We recently got our hands on some flexible filament samples, kindly provided to us by the guys at FormFutura. 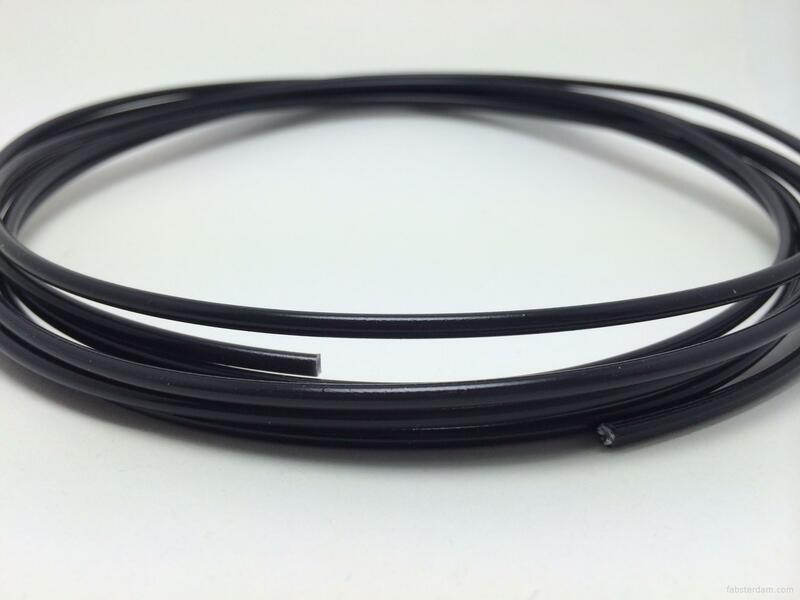 One commonly encountered problem with these filaments is their tendency to bend, buckle and loop between the extruder’s hobbed bolt and the top of the hotend. Enter the FlexyStruder, an extruder made by LulzBot to deal specifically with flexible filaments. One of the more interesting new filament types that have come out in the recent months is FlexiFil, a Thermoplastic Co-Polyester sold by FormFutura. They were kind enough to provide us with a sample so we could try it out on our Prusa i3. The guys from Formfutura were kind enough to give us some special filaments to test not so long ago. We have started our test with the Thermochrome filament. Thermochrome filament is a normal PLA filament with an additive that makes it change color depending on the temperature. Under 29ºC it looks black and above that it starts getting white. We tried our usual calibration Lego Brick in our Prusa i3 printer, which we have very much under control. Some time ago while reading about new development boards I ended up in a Microsoft site called Windows On Devices. In there they are promoting the Intel Galileo board and their dev environment with Visual Studio. 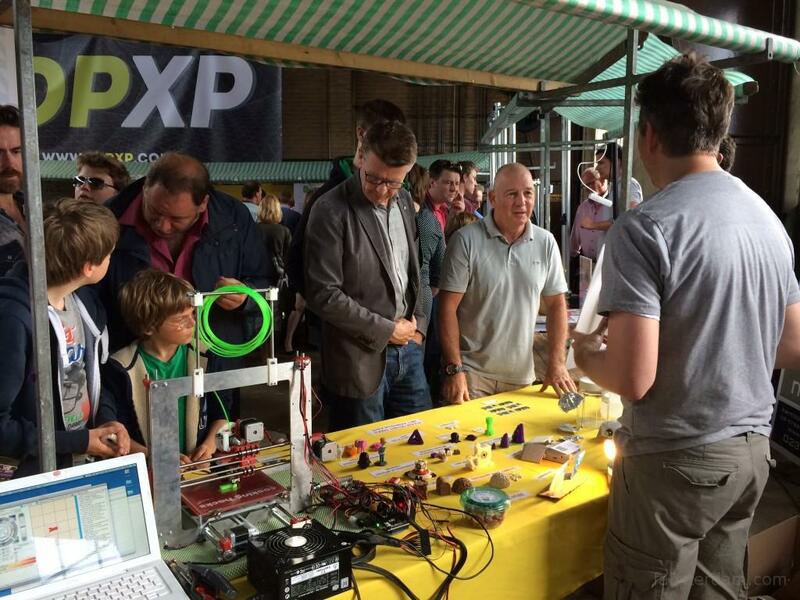 To do so, they offer a free dev kit if you register and tell what you want to do with it (and they like your idea). So we’ve decided to apply explaining what Fabsterdam is and what we do with arduinos, pis, and 3d printers and some weeks ago we received a mail confirming that they’ll send us a dev kit (YEY!). Print of the day: Aliens! Aliens printed in green ABS and smoothed with the acetone vapor bath treatment. Spaceship printed in silver ABS, in two halfs. Not treated yet. The background is just a picture that we printed in a paper to take the photo since our photoshop skills are not that good. But overall it looks pretty good, don’t you think? 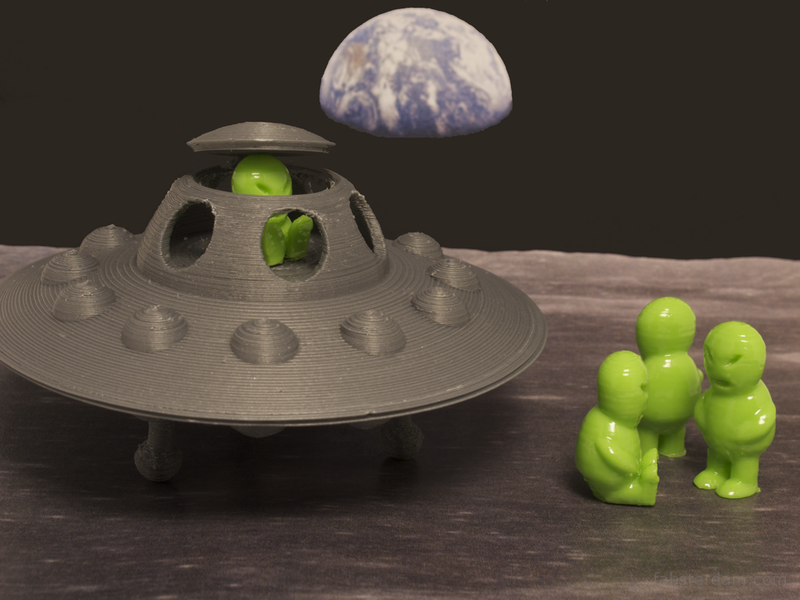 Source of the model: Flying saucer on Thingiverse.